Venezuela is expected to unveil an oil price band strategy to rebuild oil prices. Oil-producing nations around the world have been reeling from the plunge in crude oil prices. However, none is as desperate to get crude prices higher than Venezuela, which has seen its already-weak economy really start to crumble under the weight of falling crude prices. That's why it has been leading the pack to push prices higher. It now believes it has a solution, which is actually something it's taking right out of the pages of OPEC's old playbook. After months of meetings with the leaders of oil-producing countries, Venezuela is finally able to bring everyone to the table to talk about oil prices. While it's not the emergency meeting it has been pushing for, OPEC members and non-members are expected to come together on Oct. 21 for a technical meeting. At that meeting, it is expected that Venezuela will unveil a strategy from the old playbook used by OPEC and suggest it revert back to its price band strategy to revive the oil price. What the country is proposing is to set up a series of progressive oil production cuts to control prices. The strategy would build a floor for prices at $70 per barrel, with the upper target of the band stretching to $100 per barrel. According to Venezuela's longtime oil minister Rafael Ramirez, the strategy would be implemented in an effort to "try to progressively recover the price." The band system strategy was first employed by OPEC after oil prices crashed in the late 1990s, when it had a $22 to $28 per barrel band. That strategy worked relatively well until 2005, when demand for oil surged, leading prices to rise past the upper level of the band. The key to that strategy was to keep production in line with demand so that oil wouldn't drop past the $22 per barrel floor. To do so, OPEC, and in some cases non-members, would coordinate a production cut to stabilize the oil price during periods of weaker demand. We saw this strategy in action in 2001, when OPEC worked with non-members to coordinate a production cut in order to boost oil prices back into the price band of $22 to $28 per barrel. The coordinated cut was announced at an emergency OPEC meeting at the end of December 2001, as OPEC agreed to a 1.5 million barrel per day production cut, which coincided with a combined 462,500 per day production cut by non-OPEC producers Russia, Norway, and Mexico. The strategy clearly worked, as crude prices quickly rebounded back into the upper end of OPEC's price band. For such a strategy to work this time around, OPEC will need some level of non-member participation since it has made it abundantly clear that it won't cut alone. The problem lies in the fact that there have been mixed signals from both Russia and Mexico as to their willingness to join a coordinated production cut, while Norway has already said it wouldn't join a cut this time around since its production is no longer as high as it once was because of the declining output from the North Sea. Mexico is reluctant to cut for the same reason. Its Energy Minister Pedro Joaquin Caldwell told Reuters last month that, "Mexico is not influencing overproduction because Mexico's oil output has been steadily declining," and therefore, "it would be unacceptable for us to have to cut when our output is already declining," saying that a production cut "is not an option." However, Iran's Oil Minister Bijan Zanganeh, who has been working with Venezuela on getting consensus on a production cut, said Mexico "expressed readiness to cooperate with OPEC should OPEC decide to enter market management." So, it's really hard to tell where it stands. Likewise, Russia has been sending mixed signals. Its Energy Minister Alexander Novak told reporters earlier this month that it is ready to meet with OPEC and non-OPEC producers to discuss the current oil market situation. However, the country's oil producers said they won't cooperate with OPEC. In fact, one of the country's top oil producers, Rosneft, went so far as to blame OPEC for the continued problems in the oil market. Its CEO Igor Sechin said, "They fail to observe their own quotas [for OPEC oil output]. 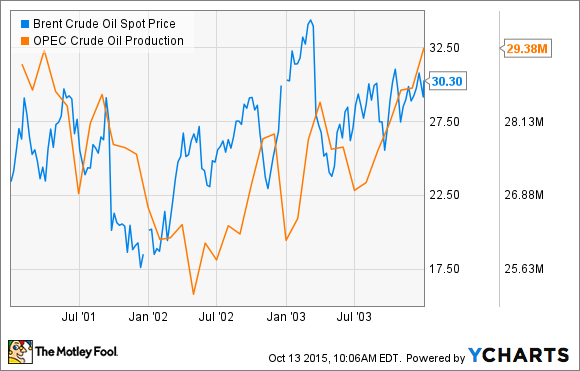 If quotas had been observed, global oil markets would have been rebalanced by now." In other words, we wouldn't need a coordinated production cut if OPEC wasn't already producing more than its stated quota. Venezuela is hoping that by reviving an old strategy it can improve the oil price and, therefore, its economy. However, it still faces a tough sell, as such a move is predicated upon non-OPEC members joining a cut again, as they have in the past. Needless to say, it will take a lot of convincing before that happens since no one is eager to turn off their oil pumps.